BY GEORGE ARTSITAS — In case you missed it yesterday afternoon, Oregon rolled past UCLA at Pauley Pavilion in L.A. by the tune of 76-67. The Ducks dominated down the stretch, forcing frustration turnovers by the Bruins and winning handily in the last three minutes. The loss snapped UCLA’s ten game winning streak and put Oregon to 5-0 and first in the Pac-12 as well as elongated their own seven game winning streak. The top scorer was Tony Woods with 18 on 8-9 shooting. He only scooped up a measely three rebounds, a very Chris Bosh-ian line though. I gave my MVP of the game to Arsalan Kazemi who put in 12 points and had 11 rebounds including some huge offensive put back in the last three minutes. 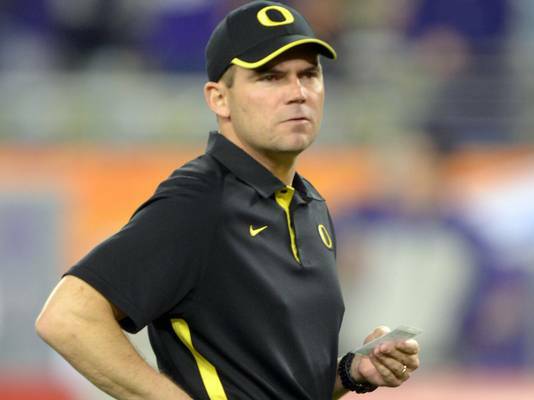 The Ducks also got some good news with Offensive Coordinator Mark Helfrich getting a promotion to head coach, taking over Chip Kelly’s huge chasm on the sideline. Kelly pushed for Helfrich to replace him whenever he made his move to the pros. Reports have even stipulated that he wouldn’t give up his spot until he knew for ure that Helfrich would take over his spot. 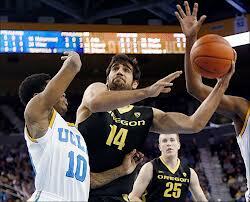 At the very least, we’ll have a semblance of what Kelly’s offense used to be. Here’s hoping he can bring something Kelly never could, a sense of how to play in close games. Oh yeah, and a National Title.